2018 November 13. Back to my roots — a medley of colours and familiar motifs. The last two weeks have been very special. They began with time with Channing, a kindred spirit whose generosity and open heart make learning fun. Then came visits to the J.D. Stevenson Gallery in Chemainus, BC, and to the studios of several very talented artists participating in the Cowichan Valley studio tour. Then, last week I completed and sold Three’s Company, which is part of a new series I call “Colour Stories”. I am grateful for the feedback I received on it and below I share some background on the origins and influences that shape it and the “Colour Stories” series. Having been raised on a farm, images of orchards, flowers, gardens, birds, butterflies, and forests figured prominently in my daily life, for I was surrounded by Nature. Images from that experience have long filled the pages of my art journals since even before I took my first art class ten years ago. Those images emerged on my canvases early in my painting career and appear again in the present series. As a young girl, my first loves were spending time outdoors, drawing, colouring, and sewing for my dolls. Sewing, and later quilting, also nurtured an appreciation for fabric and pattern, as I sewed for myself as a teen and for my children in later years and still later began quilting. To this day, while Nature feeds my soul, a visit to the fabric section of a special store like Chintz and Company has the ability to inspire me. My art, including the “Colour Stories” series, reflects the fact that I see beauty everywhere – not only in Nature but also in fabric, texture, pattern, colour, and even rust. A significant part of the creative process for me often involves taking an existing artistic technique and adapting it in novel ways that alter the technique and change its subject matter to focus on elements from my past. That is a signature feature of my altered collage series of vases with bouquets or butterflies. It is also at the forefront of my present series, which seeks to honour memories and explore both my love of colour and the interplay of pattern and design. The creation of the “Colour Series” series takes me back to my quilting days, for the process has been akin to making a quilt. In addition, the gorgeous quilts made by two friends have had a noteworthy impact on this series. Maryanna leads by example in her use of pattern and extraordinary colour in her quilts, while Jessie is both a quilter and a writer and her colourful quilts and wall hangings often tell a story. “Colour Stories” reflects my own life story and the viewer will be struck by the medley of colours in the quilt-like patches incorporated into some of these works. The images of leaves, flowers, fruit, birds and other symbols on a patchwork of pattern and colour bring joy to my heart. 15 October 2018. No Ordinary Saturday. The beauty of autumn warms my heart and brings joy to my spirit. This was especially so last Saturday. The day started with our usual Saturday morning visit to the amazing local farmers’ market and our usual weekend visit to the gym. Tending to our recently planted grass and discovering a few tomatoes ripening on the vine in the October sunshine rounded out a lovely morning. In the afternoon we enjoyed a leisurely drive to Parksville, B.C. via the coastal route, with the sun shining and the sky and waters both blue. The big leaf maple trees were adorned in the golden glow of autumn. Along the way we stopped in Bowser at Salish Sea Market — a beautiful gallery that displays the works of many fine local artists. I dropped off a copy of the tenth anniversary issue of Arabella magazine. This is the long-awaited issue which features 16 pages of colour photos and narrative about my assemblage works in the “Artists to Collect” section. Arabella is a stunning magazine that provides in-depth coverage of the world of Canadian art, architecture, and design. Its claim to offer its readers a “sumptuous journey” resonates throughout its diverse and vibrant collection of art, artists’ narratives, editorials, and more. The present issue of Arabella (Volume 11, Issue 1, now available on-line and in selected bookstores) is no exception to its tradition of excellence and I feel honoured to be showcased there. Tigh-Na-Mara is a destination oceanside resort, spa, and conference centre in Parksville. Its Food and Beverage Manager is an art enthusiast and an avid supporter of local artists. I have been fortunate to have displayed and sold paintings there for over two years and Saturday’s visit was to check on my eleven paintings, dust and straighten them as needed, and collect the proceeds from two recent sales. As a token of my appreciation I gave the manager a copy of the above issue of Arabella. It was particularly gratifying to see her reaction to the magazine and to the article on my work in it. I was surprised and delighted when she invited me to display some of my assemblage pieces at several locations in the resort’s main building. What a wonderful gift to me to have that opportunity at such a venue! Our next stop was at Parksville’s MacMillan Art Centre, where a friend has an exhibit. We arrived just minutes after closing, but I noticed an open door on the lower level and ventured in. There I was greeted by two enthusiastic artists who gave me a tour of this sophisticated and newly completed work space designed for young and old alike. What started as an ordinary Saturday turned out to be a very memorable day filled with the warmth of the sun, late fruits of the garden, spectacular scenery, new opportunities, special places, and special people. 30 September 2018. Quite a Week! What a wonderful week this has been. It started with the sale of two paintings (Patterns in the Sand and Birch Grove) from my exhibition at Tigh-Na-Mara Resort and Spa in Parksville, BC. Then on Thursday I received word that the much anticipated next issue of Arabella Magazine, with its 16-page article on my assemblage work, will be in the mail by October 6. Finally, I put the finishing touches to two large paintings on which I had been working this month. They are shown below. 13 August 2018. After the Show. What a wonderful and affirming experience the 2018 Originals Only show was for me. My sincere appreciation to all those who made me part of their day’s experience. I always welcome the feedback I receive and I thoroughly enjoy meeting new art lovers and reconnecting with earlier patrons. Of course, I am especially grateful to those who made a purchase. For me it is a privilege that my art is taken into their homes. My next show will be at the Kitty Coleman Woodland Gardens on Labour Day weekend (September 1-3). I look forward to featuring there my assemblage pieces, as they were not eligible for inclusion in Originals Only. I’ll also include various paintings in my exhibit and I anticipate displaying some new ones to be completed this month. 11 August 2018. Originals Only Exhibition & Sale. The two-day Originals Only Fine Art Show and Sale was off to a great start today — lots of art lovers, no wind or rain, and, to my delight, three of my paintings found new homes. I continue to be amazed at the great diversity and very large number of highly talented artists here in the Comox Valley. This truly is the “Valley of Plenty”. Sunday’s weather forecast is calling for good weather, so why not gather up a friend and treat yourself to some visual food for the soul at Marina Park. The show runs from 10 a.m. to 5 p.m.
22 July 2018. Back to the Easel. Spring and early summer have been a busy time for me, with much work in our new yard and vacation travel to take in the charm of Newfoundland and Atlantic Canada. Now, though, I am back in my studio painting in preparation for the Originals Only exhibition at Marina Park in Comox on August 11 and 12. Below is “Night Flight”, a recently completed piece that I’ll have at Originals Only. 21 February 2018. A New Neighbourhood & Forest Path. At one time the Comox Valley was predominately old growth forest. From the time of the first settlers, the trees began to disappear. Logging, farming, and now housing developments have changed the natural landscape. Large parks and long beaches welcome residents to walk, explore, and enjoy the natural beauty of the area. Being one of the first to move into a new housing development in the Comox Valley has meant that we have been surrounded by the sounds of construction. As the homes are completed, new neighbours move in and the street begins to feel more like home. The flurry of building activity indicates that the construction will soon come to an end and there will be more homes awaiting their new occupants. We are settled, enjoying our new space, and delight in welcoming friends, family, neighbours, and art lovers to our home. I am thankful for the pathway park just behind our neighbourhood. It provides a corridor of natural beauty for all to share. It is wonderful to walk through the trees, to hear and see the birds, and to encounter wildlife along the way close to home. This evolving neighbourhood, with its forest pathway, has been the catalyst for one of my recent assemblage pieces, entitled Overlapping Fragments. In this piece (sold during Studio Tour, May 2018), most of the materials — natural and manufactured — have been found near or along the path. Overlapping Fragments embraces the intersection of the old and the new. It takes us from the forest, through the hyperactivity of new house construction, to a place to call home. Just as we now have a new home, in the assemblage piece a hand painted bird finds a resting place on a nest of small tree roots firmly secured to the bent and rusted metal. I invite you to go to my home page for a more detailed description of this piece. 31 December 2017: New Year Reflections. Once again, the old year passes and once again I am blessed to have the opportunity to look ahead to the future. If 2018 is a gift, a book of 365 pages, how would I receive this gift and how would I choose to use each numbered and counted page? I will unwrap the gift of 2018 in good faith. Every page is, as an artist would say, a blank canvas. I alone have the unique freedom to turn the pages as they unfold to me personally, with hope, curiosity and anticipation over what possibilities they may hold. No matter the circumstances, each page will be designed and inspired by me. I alone have the unique opportunity to turn the pages of my book with joy and optimism, with courage and strength. Blank pages offer me the opportunity to live the characteristics of people I most admire, to hold tight the hand of friendship and love, and to extend my hand to others in a more compassionate and thoughtful way. This book is also the gift of time. Time to explore and expand my love of art and all it holds. To live with gratitude for the bounty that is mine and to share it with others. May 2018 bring you pages of joy and sweet surprises, active learning, good heath, new experiences, and familiar ones to savour once again! Wishing you the very best read…a gift of love, wrapped with good faith and sealed with good wishes. 5 November 2017. At last! Finally back in the swing of things. Below is “Tranquility Point”, one of my first large pieces since I moved into my new studio in late summer. Feels very good to be back painting large canvases. This painting was inspired by the fascinating skies my husband and I encountered in October while driving back to British Columbia from Alberta. 30 October 2017. Synchronicity. Earlier this month I was delighted to deliver my painting Possibility and Promise and my assemblage work Beatitudes to a person in rural Alberta. These are particularly special sales for me because of who the buyer is, how the works are going to be used, and how a relationship has blossomed through the art. What a great pleasure it was for both Rick and me to visit Carol and her husband and to see the setting in which the works will be displayed. Carol’s project strikes a very responsive chord in me and it is wonderful to experience the spiritual connectivity that Carol and I have found. I am profoundly touched and feel deeply honoured to be a part of the important initiative that is her project. When I first embarked upon painting, I thought that the joy would be in having an expressive outlet for my creativity. Little did I know at that time the joy and gratification to be found later both in learning how some works resonate in an highly meaningful way with viewers and in having interpersonal relationships flourish through the art. I feel truly blessed, and as Carol writes, “It still feels like a miracle”. 2017 October 10. Reflections on Thanksgiving. Thanksgiving weekend, the last long weekend before the weather changes, always evokes much contemplation in me. Here in the Comox Valley on Vancouver Island, the cool and rainy days of Autumn will soon arrive. Many folks here take this opportunity to visit with family and friends and BC Ferries puts on extra sailings to accommodate the many travellers. This year we are not among them, as my husband and I are staying home to tend to and enjoy our new home – a home that is one of the many blessings for which I am thankful. Yes, we are moved in, but not yet settled, for company and an unexpected trip to Ontario became priorities. A visit from my son is always a joy and, once again, it was time well spent. I am thankful. The trip to Ontario was in response to “the call”. My elderly Mom was in hospital and the prognosis was not good. Her poor health and limited abilities had become more and more challenging. She was ready to go, and I think that, as family, we were ready, too. The time I spent with her was amazing; we shared some truly meaningful moments for which I am thankful. Miraculously, though, she pulled through and on Thanksgiving Sunday, she celebrated her ninety-seventh birthday! I am, indeed, thankful. This unplanned visit also gave us the opportunity to reconnect with siblings on both sides of the family and to attend a yearly gathering. It was also very special. Here at home there is lots left to do…a few boxes not yet unpacked, the garage to organize, etc. One of the biggest challenges for my husband and me was the thirty panels of cedar fencing that needed to receive at least one coat of stain before the arrival of the Fall rains. “Mission accomplished” I am relieved to report. The newly seeded grass, planted late in the season, needed warmth and sunshine and we were not disappointed. What can be more glorious than beautiful Fall days? Each day was a gift and I am thankful. Juncos, one of my favourite birds, have discovered the recently seeded back yard and I have discovered that they are very brave little birds. They exhibit a feisty attitude and are not intimidated by the noises and gestures I make. Today, however, there is now a lovely green blush across the back yard. Over two dozen hungry Juncos, feasting for days, have not eaten all the grass seed after all. I am thankful. Recently, I reconnected with a longstanding friend after more than twenty years had passed since our last communication. The synchronicity was amazing. I am delighted that she discovered my work and will include one of my intuitive pieces in her “Sanctuary for the Soul” — a special space she is developing in which to hold workshops and other activities that appeal to and support women’s spiritual growth. I am honoured, deeply touched, and truly thankful to be a part of that and to have friends near and far. My new studio beckons for attention…well, not really. I’m the one who looks forward to happy creative times there soon. For those opportunities and the wonderful space, I am thankful. Not spending this Thanksgiving weekend with family makes me even more aware of how special each member of the family is to me. My three kids and two step-kids, and eight wonderfully unique grandchildren, ranging in ages from nearly 20 years to 2 ½ years, are a source or pride and enjoyment. I am thankful for the privilege of being their grandmother and for the profound blessing of my children and their spouses. Last, but not least, my husband Rick – a man of faith, whose love of family is strong, support for my work unwavering, and compassion for others unceasing. I am thankful. 2017 September 28. Airport Exhibition. Excited to learn today that my assemblage sculpture “From The Ocean” (for picture see Nov. 14, 2016 blog entry below) has been chosen by the jury to be one of several pieces of art to make up the winter exhibition at the Comox Valley Airport. Installation and launch will be at 12 noon on November 8 at the airport. This event was organized by the Comox Valley Community Arts Council — a vital part of the Comox Valley art scene. 2017 March 15. Additions to Portfolio. Today we added to my Welcome page and to my 3-D Assemblage page in the Portfolio folder images of my 3 most recently completed assemblage pieces. One (Renewal) is shown below. Renewal. 3-Dimensional assemblage. 22″ wide x 4.5″ tall x 4″ deep. (#1367) Scroll down for description. Photo by Boomer Jarritt. 2017 March 10. Art Splash! at The Pacific Rim Whale Festival, Ucluelet, BC. We drove to Ucluelet yesterday to deliver 3 paintings to be exhibited as part of the Pacific Rim Arts Society’s Art Splash! Annual Art Show, which runs March 10-26, 2017 in the huge lobby of the Black Rock Oceanfront Resort in Ucluelet. The show features many contributing artists, carvers, and artisans. I’m privileged to be exhibiting my pieces among such outstanding works. 2017 March 8. Amazing developments. Life has been hectic around here. We’ve sold our house and my beloved studio and are having another built for us here in Courtenay. Of course, it will have a bigger studio and more storage space. As if that were not enough, Rick and I have been out of province visiting family and I have been trying to come to grips with a marvelous opportunity that has come my way. A lengthy article on my assemblage art and me is to appear in the summer harvest issue of one of North America’s premiere art magazines. I’m ‘over the moon’ delighted with this, but we have some pressing deadlines to meet and I’ve been busy completing more assemblage pieces for today’s photo shoot for the magazine by acclaimed photographer Boomer Jerritt. More on the article and the opportunity in a later post. Below is a picture of Boomer at the end of his 75 minute set-up for the shoot in my studio. I feel very fortunate that he had an opening in his busy schedule to fit in my job. It’s been fascinating to chat with him while he works, about his travels, his photo shoots, and his wealth of life experiences. I’ll wait for his images of my newest assemblage pieces before showing them on this website. 2017 January 3. Assemblage again. It’s that time of year to reflect on the past 12 months and look forward to the next twelve. For me, the past year was a creatively exciting and productive one. It began with a strong nudge to ‘do something’ with my little treasures. Now, I have a confession: I’m a collector. This trait began in childhood days on the family farm and continues to the present. Over the years, I have been blessed to have lived many places in Canada and I’ve stashed away in boxes numerous keepsakes from those earlier days. I’ve also inherited old books, ledgers, and photos from my family. Needless to say, thrift stores also hold great appeal to me. I also enjoy beach walks, neighbourhood construction sites, and of course the beautiful forests near my home. A walk often yields a small treasure, such as an interesting piece of wood, colourful stones, rusty nails, and beach glass, to mention just a few. This abundance of material was just waiting; but waiting for what? For several months, I felt an inner call to use these found objects and re-purpose them into a visual, natural form of self-expression. By sheer serendipity, August brought the breakthrough in the form of my discovery of assemblage as an art form. I emptied boxes and spread the contents on my studio floor and table. What a mess! At first, I didn’t know where or how to start. However, I persevered, albeit without any plans or set ways to guide me. I had only my intuition, a desire to share with others what is made in the solitude of my studio, and the hope that my creations would resonate with them in a meaningful way. I have been delighted with the positive feedback I have received on my assemblage work. In 2017, I am eager to further develop assemblage, to stay curious, and to respond to the inner call of other creative pursuits. Perhaps 2017 will bring a call in your life to try something new. I encourage you to answer that call with joy and enthusiasm. It is a course of learning and fulfillment that I know you will be glad you embarked upon. Please see blogs of Sept. 27, Oct.18 and Nov.14 &17 for other entries on assemblage. 2016 November 26. Great Start to Studio Tour. The Central Island Studio Tour and Art Sale is now on. The weather has improved and one of my first visitors today purchased Sea Foam. A sincere thank you to Janet for that and to a fine artist and fellow art enthusiast for her purchase of Transformation— my first sale of a piece in my recently launched assemblage series. I am grateful to all who took time out at this busy time of year to visit today. It was a great joy to me to meet so many interesting people and to welcome various longer-standing friends and associates. Activity on my website has also been humming since my Thursday e-mail to past patrons and past visitors to my studio. To all my website visitors may I take this opportunity to thank you for your time and your interest in my work. Everyone is welcome to come tomorrow to see the studio and the 59 paintings and the remaining 1o works of assemblage art I have on display throughout the house. 2016 November 17. Commentary on Assemblage Pieces. Today additions have been made to my Welcome page, such that when you click on an image to activate the slide show, a message at the end of the title bar for each assemblage piece invites you to scroll down for a description of the piece. The same is true of the assemblage images in the “Assemblage 3-Dimensional Art” folder of the Portfolio link. These descriptions explain some of the symbolism and share some of my thinking as I constructed the piece. I invite you to check it out. 2016 October 18. Class and Assemblage. Very exciting week for me. Thoroughly enjoyed the Sidney Fine Arts Show on Sunday and would recommend it highly to anyone who has not experienced it. I’m off this morning to a class on encaustics with Pat Scrivener in Parksville, BC – very much looking forward to it. Have also been receiving very gratifying feedback over the last few days and weeks on my series of assemblage pieces from an highly respected gallery owner and her staff, from the editor of my favourite art magazine, and from several local artists whose professional opinions I also very much value. Below is one of my most recently completed assemblage pieces. Assemblage is a new and exciting art form for me. The idea, rooted in the joy I find in collecting natural elements and interesting materials, had been with me for months. I delight in small discoveries and little curiosities and figured that there must be a creative way of incorporating these various elements into a common form. Each piece tells it’s story and collectively they have a stronger voice. I refer to assemblage as “art sculpture” for it is not about randomly placing items –such as antique pieces and found objects– down on a three dimensional platform and calling it done. Rather, for me assemblage is an opportunity to create a convergence of the distant past and the present and everything in between. It is the coming together of symbols, images, industrial and domestic objects, and antiquity; the contemporary and the nostalgic, the rustic and the genteel, the natural and the manufactured. These objects are carefully mined for metaphors. Favourite treasures, discarded pieces, and small objects of the past are thoughtfully reassembled. As the eye moves around each assemblage it is my desire that the individual elements come together in a meaningful way in which curiosity is aroused or memories are recalled. The experiential component makes my assemblages unique. Each one offers the opportunity to engage with the piece. Many of the art sculptures are interactive. There may be a small drawer to open and into which a personal note or small keepsake may be placed. There may be an empty picture frame in which to place a special photo , or an hour glass to be turned, or perhaps a vessel to open to experience it’s contents. Seldom does an art piece encourage others to truly make it their own by physical participation. The assemblages offer a sculptural presence where form and function meet, that of fleeting moments and time preserved, indeed the seasons of life. 2016 August 7. Originals Only. The summer Originals Only exhibition is in progress today. Great to connect with friends, patrons, exhibiting artists, and others who also appreciate fine art. Here’s a picture of my display. 2016 May 28. Central Island Studio Tour Off to Great Start. Visitors on the tour started arriving promptly at 10 a.m. yesterday. I was delighted to make a sale to my first guest, who went home with my most recently completed work “Blossoms”. Yesterday and today I’ve thoroughly enjoyed meeting many folks for the first time, welcoming back several former visitors, and chatting with everyone. Feedback on my work has been most affirming and appreciated. 2016 April 30. Central Island Studio Tour & art for sale, coming May 27th, 28th & 29th Black Creek to Parksville. My Studio is #15 on this self guided Spring tour. This is an invitation to join the many others who enjoy this wonderful opportunity to explore the area, discover studios and meet the artists . You will have time to chat about art and view the work of dozens of artists. For me, this is an event I truly look forward to. My “cottage” studio is attached to my home and is nestled in the garden. As I write, I am looking out the garden doors and enjoying the view in the gentle light of the setting sun. The most beautiful pink flowers on the peony tree, white Bleeding Heart and Wind Flower, blue Cornflower, and a few remaining tulips are catching my eye. By Studio Tour time, there will be a host of other flowers at their showy best. In the studio, well, it’s a bit messy. That is good, because for me a tidy studio is an unproductive studio. I love to experiment and to try new things on the canvas. A departure from this has been the clay class in which I’m participating. I’m hoping to create assemblage — a three dimensional creation akin to a collage in the sense that it incorporates many distinct elements. For instance, I think that some of my small clay creations will find their way into this “3-D collage” along with many interesting bits and pieces of the past that I have inherited. I also love to gather little pieces of nature and have been known to bring home “interesting” curiosities from the thrift shop or garage sale. Perhaps some of these diverse items will come together in a way which will have special meaning and provide little glimpes of my life’s journey. The personal messages and symbolism of these objects will resonate with each viewer in a different way. An object that has one meaning for me might well have a very different meaning for someone else. I feel that many of my paintings tell a story. Assemblage is another form of story telling. It is both challenging and reflective. I find it very inspiring! 2016 April 27. New Additions to Welcome Page. I have had a busy several weeks that have taken me back into the studio. Although I have done much experimenting recently with clay, I have also been painting on canvas. Seven new paintings were added to the Welcome page of this website in the last 24 hours. 2016 March 16. ArtSplash in Ucluelet. To my surprise, my work is now part of the ArtSplash Annual Art Show held by the Pacific Rim Arts Society (pacificrimarts.ca) at the spectacular Black Rock Oceanfront Resort in Ucluelet, B.C. After enjoying a delicious lunch at the Black Rock, my husband and I took in the ArtSplash exhibition in the grand lobby of the hotel. He had one of my recent favourites, Pacific Symphony, in the car for another purpose and, thanks to the kindness and flexibility of the show’s co-ordinator, Suzanne Ryles, it was accepted into the show. I am pleased to now be a member of the Pacific Rim Arts Society and I look forward to participating in their future shows, too. Check out http://www.pacificrimwhalefestival.com/events/ for other special events offered as part of the Whale Festival. 2016 March 12. Exhibition on Now at Tigh-Na-Mara Resort. Earlier this week we installed the first ten paintings (including three new ones) of my two-part exhibition at Tigh-Na-Mara Seaside Spa and Resort in Parksville, B.C. The remainder of my exhibition will be installed in the coming weeks. I encourage art lovers to stop by and wander throughout the main building (including downstairs) to view the approximately fifty paintings and photographs on exhibit by several artists/photographers. I am honoured to have my works included among such high quality pieces by these very skilled professionals. My sincere thanks to Fohla Burton and General Manager Paul Drummond for this opportunity. With Fohla’s eye for art, the Resort is becoming a ‘must see’ venue for art lovers on Vancouver Island. My husband and I have dined several times at Tigh-Na-Mara’s Cedars Restaurant and Lounge and we certainly recommend it. Among our favourites so far are the seafood chowder, salmon burger, caesar salad, and ‘The Cedar Burger’ ( 7 oz. Certified Angus Beef® & ground pork patty, bacon jam, smoked Gouda, lettuce, tomato). 2016 February 26. The Gift of Creativity. Each day offers new energy to pursue the creative process and to look, with new eyes, at what I am doing. Painting (acrylic and mixed media) has opened new ways of seeing the world around me, and compels me to commit to these media and to explore their limitless possibilities. Is it possible that each of us has limitless creative possibilities? Is it possible that the gift of creativity is a gift that has been given, and yet for the most part remains unwrapped? If there were a brown paper bag left at our doorstep, with our name on a tag, would we not be curious and open it? If there were a gift under the Christmas tree, wrapped beautiully with our name on it, would we not want to open it? Creativity is such a gift. We may feel that we really aren’t creative (the brown paper bag) or perhaps we have the beautifully wrapped gift but are reluctant to open it fully. Perhaps we are too timid to try something new, or to revisit a former creative passion. We may be aware of our creativity, yet have not committed to its expression. Do you have the potential for greater creativity that longs to be opened? Open your gifts! Imagine what treasures you will uncover. Your creative expression longs for a voice. Speak up, sing out! Exercise your creative muscles. Watch them grow. Celebrate the process! You have only just begun. 2016 February 20. It’s Contagious! The Recreation Centre in Courtenay offers a plethora of courses each season, including an 8:00 to 9:30 pm course this Winter that I just couldn’t ignore — Clay Works. “Whether you like traditional sculpture or would like to create funky, functional pieces of art, this class is for you…” said the ad. I turned up for the first class feeling excited about trying something new, but a bit weary from a busy day. However, instructor Jenja McIntrye was more than enthusiastic. She shared her love of clay in such a way that, before long, I was weary no more. She was truly excited about teaching this class. No doubt, she was weary, too, but her enthusiasm simply bubbled over. Working with clay, the wheel, slab creations, simple sculptures — everything each one of us creates clearly brings her joy. Her passion for what she does is evident. She gives support and makes suggestions. We are on our own to experience clay for our selves. I learned of Jenja’s classes for children. She truly is an inspiration and role model for young and old alike, including for me. I feel blessed to take this class with her. She reinforces my long-held belief that each day is a gift; it is the day I am given, to enjoy its possibilities. A positive spirit is contagious. Thank you Jenja. 2016 February 6. Official Opening of Exhibition at Pearl Ellis Gallery. I very much appreciate the interest and support expressed by the many people who attended today the official opening of my exhibition with Gail Neuls at the Pearl Ellis Gallery in Comox. Our special thanks also go both to those who came from out of town and to the Gallery volunteers. Without the dedication of the volunteers these events would not be possible. Congratulations to door prize winners Brenda Calhoun and Susan Frankowski. 2016 February 2 Website updated. This website has undergone a significant revision over the last few days. Several new paintings completed during that time have been added, including the one which will be given away on February 6 as part of the free draw at the exhibition at the Pearl Ellis Gallery. See “Home and Recently Completed”. 2016 January 29 Passion, Curiosity, and Trust The artists whom I most enjoy are passionate about creativity. It shows in their work; each piece is a demonstration of this passion. For me, curiosity walks hand in hand with passion. I love to explore new techniques, new products, new colour combinations, new shapes or lack there of. Curiosity is what fires my creative furnace! This month, I enjoyed the process of exploration. Two paintings (Circle Dance and #1202 featuring a globe and spire) were done with shape and colour in mind, and also leaving much empty space. ‘Why is it necessary to fill in all the gaps?’ was a question I asked myself. Circle Dance is an example of this and the as yet untitled #1202 (globe with spire) even more so. What do you think would be a good title for it? My art work is eclecletic. It is a reflection of my personality. I paint a wide range of subjects because so many things fascinate me. My most recent paintings of chickadees are soft and simple — a quiet palette. I love nature and find myself drawn to birds (they often pop up in paintings) but this time they get to have centre stage. Chickadees are playful in their motions and in flight. They are delightful to watch and make their presence known at all times of the year. These two paintings (#s 1252 and 1151) are almost complete, but are not yet titled. Another ingredient in my work is trust — trust not only to follow the inner nudge, but also to enjoy the experience of creating, and to share art and the enthusiasm of creating with others. I hope it is contagious! I welcome November days. Yes, for me the arrival of November means lots of studio time which, of course, I just love. The first few days of the month were filled with preparations for the Fall Edition of the Central Island Artisans’ Studio Tour, November 7th and 8th. It is always wonderful to gather up some of my favourite paintings to go along with the new. Fall seemed to bring a trip down memory lane. Oh, how farming has changed since I was a child. Now, for the most part, it is agribusiness. Perhaps it was a chance to get in touch with my rural roots, that old barns held such an appeal and found their way into three paintings. Winter Rendezvous and some other paintings were also added to the collection on display. Particularly meaningful to me were two paintings (Fall and Summer Meet and Light Conquers Darkness) inspired by the situation of my friend Alison. I learned with joy yesterday that her four young missing children have been located in northern Iraq, although not yet returned to her. Proceeds from the sale of these latter two paintings will be contributed to Alison’s fund-raising campaign to defray expenses incurred in searching for the children. The Studio Tour was fun. It is lovely to meet and greet new and familiar faces alike. Over 60 people dropped in during this self-guided tour. Later in November we were pleased to attend the Comox Valley Arts gathering at the Red Tree Coffee House to meet and chat with many of the tour’s participating artists and to thank the Arts Council for its support of the 54 artisans on the Fall tour. Their lovely brochure and map provided a quick and easy reference for visitors on the tour. Rick and I enjoyed a couple of relaxing days in Victoria last week. We took the opportunity to visit the Westend Gallery and to stroll through the Brentwood Bay Resort and Spa with it’s wonderful display of art featured throughout. Of course, a trip to Victoria wouldn’t be complete without a visit to Opus for much needed paint supplies. For the first time, I’m holding a special pre-Christmas sale from December 6-21. (My apologies to those for whom most of the e-mail text about that sale was inadvertently pushed to the end of the message.) The offer is extended to past patrons and to past visitors to my studio. I do know that there is more than one way to “deck the halls”… perhaps a “Ponting Painting” would do the trick. I invite you to check my web site: http://marthaponting.com or better yet, call me at 250-331-9607 to arrange for a wee visit to see the art in person; it truly is the best way, and there is, of course, no obligation. It would be lovely to have you visit. 10 October 2015. Expand Your Creativity. I felt very fortunate to have been a participant in a three day workshop with Donna Baspaly and Diane McCarten October 2-4 in lovely Parksville on Vancouver Island, British Columbia. The experience was simply amazing! I found myself in a class, surrounded by many gifted artists as well as our two very accomplished teachers. I didn’t know what to expect from these three days. Now, I appreciate more fully the ancient proverb that states, “When the student is ready, the teacher will appear”. This exploratory ‘boot camp’ pushed and pulled me in directions where I had not gone before. It was a three day journey of discovery with the emphasis on expanding personal expression. Composition, design, mark making, building a series, painting with a triad, values, darks, grays, veils, opaques, transparencies, cool, warm were included and much more. Critique also played an important role. There were valuable learning opportunities in listening to critiques of my own work and the work of others. Donna and Diane are a wonderful teaching team. Each brought her unique gifts to our learning experience. Their leadership provided a relaxing and supportive environment and for this I am thankful. 28 August 2015. August has been a very full month, but very gratifying for me on the art front. With the much enjoyed visits of family, I have done little painting in the studio, except for a fun piece done collaboratively with my young granddaughters. It has, though, been a good month for sales (five). The Originals Only exhibition in early August certainly attested to the truth of the maxim that not all the sales that result from an exhibition happen at the exhibition. I particularly appreciate the opportunity to see how a painting looks in the patron’s home. So, I was excited when a couple accepted my offer to bring the three paintings in which they were interested to their home to enable them to see how the paintings actually look there. They even asked for my input on which looked best and where. 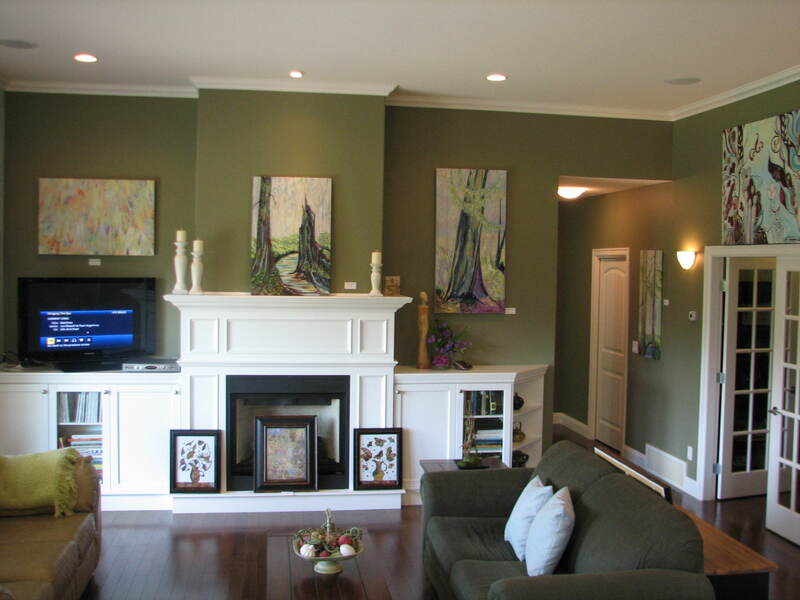 Both paintings they purchased are very well suited to their beautiful home, which makes me very happy. And what a privilege it was to meet this charming couple. Some other aspects of being an artist which give me great pleasure are doing charitable work and learning new techniques. This month provided an opportunity for both, as I participated in an Habitat for Humanity ReStore project (see the whimsical painting below) and immersed myself in some on-line videos by another artist whose work is similar to the pieces in my ‘Intuitive’ series. and will start afresh on another one or two which I hope to have completed by then. Sure am glad our much needed rain is coming this weekend rather than that weekend! 4 August 2015. Finished “Tranquility” today. Now on to the canvas that is our backyard, before starting preparations for this weekend’s exhibition as part of “Originals Only” at Comox Marina Park. “Tranquility” will have its debut there, although it is on this website. 29 July 2015. Pleased with the substantial turnout at our exhibition in gorgeous and bustling Tofino yesterday and today. My thanks to all who attended. I met some fascinating individuals from several different countries, made some sales, and thoroughly enjoyed the magic that is Tofino. 26 July 2015. “Pacific Moon” is now posted on the “Home and Recently Completed” page and on the “Land, Sea, and Sky” page. 25 July 2015. Tonja Bjermeland suggested a way to exhibit more paintings at The Wickaninnish Inn next week without making the room look cluttered. Looks quite do-able. Am pleased because that means I’ll have at least 15 paintings in the exhibition and at least 4 of them will be new since our exhibition last month at Qualicum. Finished “Symphony” yesterday and “Pacific Moon” today. My harshest critic (husband Rick, who is also my biggest fan) really likes them both. “Symphony” has now been posted on the web site on the “Home and Recently Completed” page and “Land, Sea, and Sky” page, but will wait for tomorrow’s natural light to take a picture of “Pacific Moon” to post on the web. 23 July 2015. Computer problems solved and ‘Tide Lines’ is now posted on my “Recently Completed” page. Am working on another piece for Wickaninnish Inn exhibition next week. Feels really good to be back at the easel, brush in hand. 17 July 2015. Can’t believe it’s been a month since last posting. Very pleased to get back in studio this week after some weeks away visiting family. Delighted also to have had another wonderful exhibition opportunity arise, this one as a result of the ‘Colourburst at Crown Mansion’ exhibition. Will be creating new pieces for it as soon as our (Tonja Bjermeland and me) July 28-29 engagement at The Wickaninnish Inn wraps up. More on the new opportunity in next post. In the mean time, here’s hoping that Rick beats his computer problems and is soon able to post the piece I completed today. 16 June 2015. We were in Qualicum Beach, Coombs, and Parksville today. In Coombs we bought some easels for use at this weekend’s show and had a delicious dinner at Cuckoos Restaurant. In Qualicum we stopped in at the Crown Mansion site and finalized arrangements with the affable manager, Michelle. We also checked out the newly renovated cabana house where the exhibition will be held and were pleased to see how fresh and modern it looks. Qualicum was where we also picked up a copy of the Parksville-Qualicum Beach News with our advertisement in it and distributed a poster and rack cards to various downtown merchants and hotels. We took posters and rack cards to various hotels and commercial establishments in neighbouring Parksville, too. We were impressed by the very friendly reception we met from everyone we approached to display our materials. We also discovered, and made note of, many very inviting eateries and possible venues for future exhibitions. Finally, we closed out our day with Rick posting the fourth (final) segment of his account of behind the scenes activity in preparing a show such as ours this weekend. It is found immediately below. 16 June 2015. Behind the Scenes (Part 4 of 4) The final hours of the long day before an exhibition involve wrapping the paintings, gathering or assembling easels for displaying works, testing the lights and extension cords, and ensuring that the site kit is fully stocked (e.g., receipt book, pins, plastic straps, business cards, red dots). We also have to anticipate all tools and supplies that we’ll need at the exhibition site. Then comes the art or semi-science of loading the vehicle, with the display panels the first thing to be loaded. Extreme care must be taken at this stage to ensure that no corner of any painting is pressing against the canvas of another painting, as that would stretch or puncture the canvas. Similarly, display frames must be protected from chaffing which would ruin the appearance of the frame. With luck, it isn’t raining and set-up occurs the day before the exhibition. Otherwise, we rise very early on exhibition day to attend to last minute details and drive to the site to set-up. We need a safe and dry spot to place the paintings while we remove the display panels and put them in place. My previously sketched set-up map, a level, and a tape-measure are invaluable when it comes to mounting the paintings on the panels. After I hang the paintings, we pin up the title/price cards, and then, when spouse is not looking, go around ‘straightening’ the cards or paintings that (s)he just ‘straightened’. Hiding the wraps, the ladder, and the site kit is the last task. Then, “Voila!” – an art exhibition – open only 3 minutes after the advertized start time. 15 June 2015. Behind The Scenes (Part 3 of 4) A press release can be very helpful in raising the profile of the exhibition. Finding the right ‘hook’ for the press release was not a problem for the Crown Mansion show, as Qualicum’s famous antique car show is being held in town at the same time. Nevertheless, when Martha is in a joint-exhibition with one or two other artists, I find it helpful to interview the other artist(s) in preparation for writing the press release. They are always quite generous in finding the 45-90 minutes for that interview. Over the years, the newspaper editors also have extended their generosity to us, as they have printed all my press releases, often with one or more colour images I’ve supplied. Those images often include a shot of the artists together. Getting each to agree on whether she looks ‘presentable’ in any given such photo is another matter altogether. The appearance of the ad in the newspaper is a sure sign that we’re into the ‘home stretch’ of preparing. If not already done, distribution of posters to commercial establishments, rack cards to hotels, and flyers in selected neighbourhoods occurs now. This can be a time-consuming but, fortunately, calorie-burning task. It’s also time to attach hanging hardware to the new paintings and up-date the list of persons who have asked to be on Martha’s art e-mail list. A brief invitation to the event is e-mailed to them a couple of days in advance. Curating the exhibition is a task that comes into focus during the last few days. The ideas and intentions of the last few months are reviewed and revised to take into account new works that Martha has just completed. Always we’d like to include many more paintings than can actually be included. In making selections, we try to achieve the right mix of sizes and price points, new and older works, palettes, and genres. Deciding where to place paintings on panels takes about 3 to 6 hours and is sketched out on the computer for ease of revision. We try to ensure that colours of adjacent paintings don’t clash, that a panel doesn’t look top-heavy, that a feature wall is optimally used, that paintings actually fit on the panel, that balance and symmetry are achieved, and so on. With an additional artist in the exhibition there’s the added concern of ensuring that each artist has a fair share of the prime locations and that each has about the same amount of display space. This requires collaboration among the artists. Deciding on the paintings is one thing, but finding them is quite another, especially when the title of the painting is not self-evident, such as with abstracts or with Martha’s ‘intuitive’ series. All Martha’s works have an inventory number on the back side. For paintings on the wall in our house, I’ve learned also to put the inventory number on masking tape on the bottom of the painting. That makes it unnecessary to take a painting off the wall to check it’s inventory number to determine whether it is one we have listed to include in the exhibition. Similarly, in the garage I’ve had to establish a locator system to enable me to find paintings in storage. When it comes to the wrapping (another time-consuming task) to protect each painting in transit, all I can say is that I hope that someday the ‘lightbulb’ will go on and I’ll hit upon some better way of protecting the paintings or at least of locating the wraps. I keep telling myself it’s not rocket science. 14 June 2015. Behind the Scenes (Part 2 of 4) Composing the advertizing materials requires some marketing flair and some skill with computers and, ideally, with graphic design. Fortunately, Martha’s colleague for this exhibition, Tonja Bjermeland, has those skills and created some very attractive advertizing for us. This is a collaborative, iterative process involving a fine-tuning of the message, graphics, layout, and fonts. Over the years we’ve learned that careful proof-reading at every stage, including the work of the print shop and the newspaper, is a necessity, not a frill. Discovering a typo, or worse, on a finished product is not an happy experience. Social media are a resource in which I have minimal experience. Fortunately, Tonja took on the task of creating a Facebook page for the Crown Mansion show. Signs can be a real hassle and even 24” by 18” corrugated plastic lawn signs are very expensive. Much planning goes into optimal locations and design. Liaising with the town by-law officer is wise, especially since a sign permit may be required, as was the case with the Crown Mansion exhibition. Sometimes signs from a previous event can be used, with modification by means of an adhesive decal. Even the decals are expensive, though, and must be applied with great care and patience. Directional arrows, also in the form of adhesive decals, can be attached to plastic signs, but great attention to detail is required here in order to avoid affixing an arrow that, once the sign is in the ground, points drivers away from the exhibition. I’ve found that I must number each respective sign and compile a detailed list of specific locations that shows what sign goes where, what way its arrows are to point, and whether it is two sided or one sided. Once the signs have been installed – itself not an easy task due to gravel beside the road shoulder – they need to be checked each day for vandalism, wind damage, etc. While I’m attending to minutiae, Martha is often ‘painting up a storm’ in her studio. That leads to the need to photograph the new works, manipulate the image to make it look as close to the original as possible, and mount and label the new photos at the appropriate places on her website. Part of that process involves brainstorming a title for the works (if Martha doesn’t already have a title), pricing, and updating the inventory system on the computer. In-home printing is done not only for Martha’s business cards, but also for the title/price cards displayed beside each respective painting. Care is also needed at this point to avoid embarrassing or costly inconsistencies between the website and the card. Sometimes Martha has art cards made from her works so that she can offer them for sale at the exhibition. Choosing the images is the first step in this process. After that comes the obtaining of quotes from print shops, settling on print-run size for each image, and inspecting the proofs. The envelopes and protective plastic sleeves are sometimes not sold by the printer, such that shopping for them is required. Then, each card must be folded and inserted in the sleeve with the envelope. 13 June 2015. Behind the Scenes (Part 1 of 4 by Rick Ponting) What goes on behind the scenes to present an art exhibition? While different artists will approach this differently, in this posting and in the days to come, I’ll describe what’s involved when Martha has an exhibition outside the home with one or more other artists. 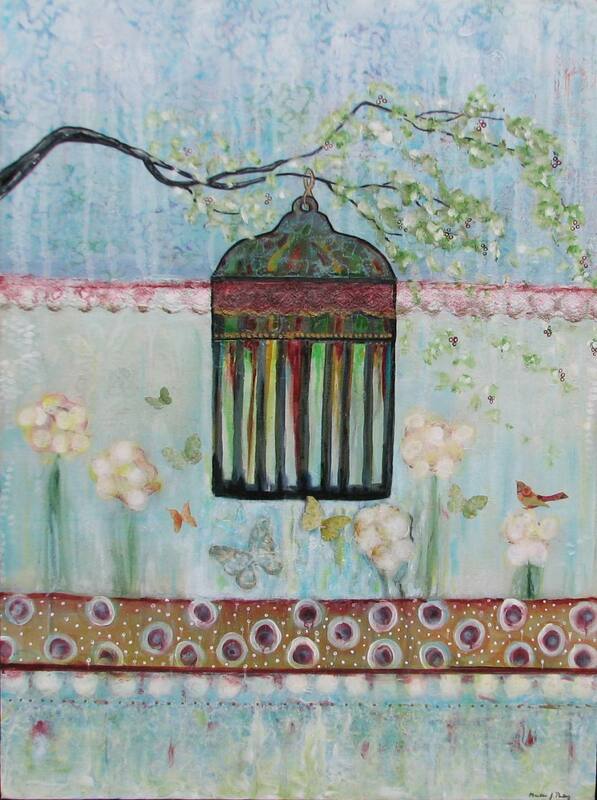 I’ll use Martha’s June 20-21 exhibition with Tonja Bjermeland at Crown Mansion in Qualicum Beach as a case in point. The story will take us only to the time where the exhibition opens and will not deal with the tasks involved during and immediately after the exhibition. There are many potential opportunities for displaying fine art. Strategic planning done early in the year can help the artist to focus on those opportunities which align with the artist’s goals for the year. 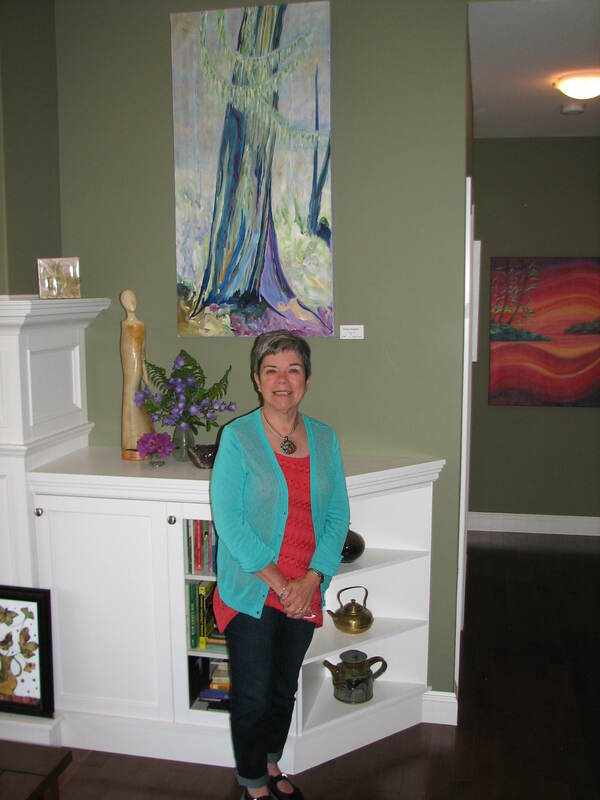 This year, Martha decided both that she wishes to have more exposure of her work to persons outside the Comox Valley and that she needs to expose her art more to tourists. Exhibiting at Crown Mansion squarely addresses both those goals. Before deciding on the Crown Mansion venue, we checked out the site on the web and spoke with the manager by phone to assess availability and feasibility, including rental rates. This, and a site visit, happened in January. The site visit involved various measurements, about 30 photos of space and lighting, drawing a plot plan of the site and locating lights and electrical outlets on the floor plan of the rooms. These numerous bits of precise information become valuable in deciding from home what space will be allocated to each artist (total running wall length and presence of feature walls) and what pieces will be displayed where. One doesn’t want to discover on the morning of the exhibition that a painting is too wide for the spot envisaged for it and that the ideal painting for that spot was left at home. Fairly early in the planning of the exhibition a rough expenditure budget is prepared to provide some guidance, especially for later decisions on advertizing. With venue rental fees, insurance premium, travel expenses, and just one relatively small colour newspaper ad, expenses mount up. Then there are signs, flyers, posters, and rack cards. Getting rough quotes from printers and meeting with the partnering artist early on is important in order to reach a consensus on the advertizing strategy and tactics, such as the print-run size for each advertizing item. 12 June 2015. Posted 6 new works to the ‘Home and Recently Completed’ page of this site today. Am particularly pleased with how “Beach Comber’s Bliss” turned out. Like my “Waiting For Winter”, it uses a canvas with a recessed space in the middle. With “Beach Comber’s Bliss” I’ve assembled some beach glass, shells, etc. in that recess. What do you think of that effect? Should I look for more canvases of that type? In the ‘Portfolio’ page I now have a new folder entitled “Art Cards and Objets d’art”. So far, that folder contains images of 3 pieces I’ve done in acrylic on rusted tin shingle, plus several art cards I’ve had made, including some from recently completed works. Have you ever wondered what goes on behind the scenes to put on an art exhibition? Actually, there’s a lot. Tomorrow, my husband will start a four-part contribution on that topic as par of this blog. 08 June 2015. Preparing for Colourburst at Crown Mansion — less than two weeks away. New paintings in progress, signs are ready, flyers printed, art cards in to printer, ad submitted to newspaper, etc. Checking long-term forecast to see if good weather is in store for June 20 and 21. Would be great for the classic car show and great for us, as it would allow us to use the beautiful grounds of Crown Mansion as well as the cabana house, to exhibit our works. 24 May 2015. Here are some pictures from my exhibition today at the Central Island Artisans’ Studio Tour. Click once on an image to enlarge it. My work “Pensive” in our dining room over a family heirloom affectionately known as “Daddy Hutton”. Who left the television on? 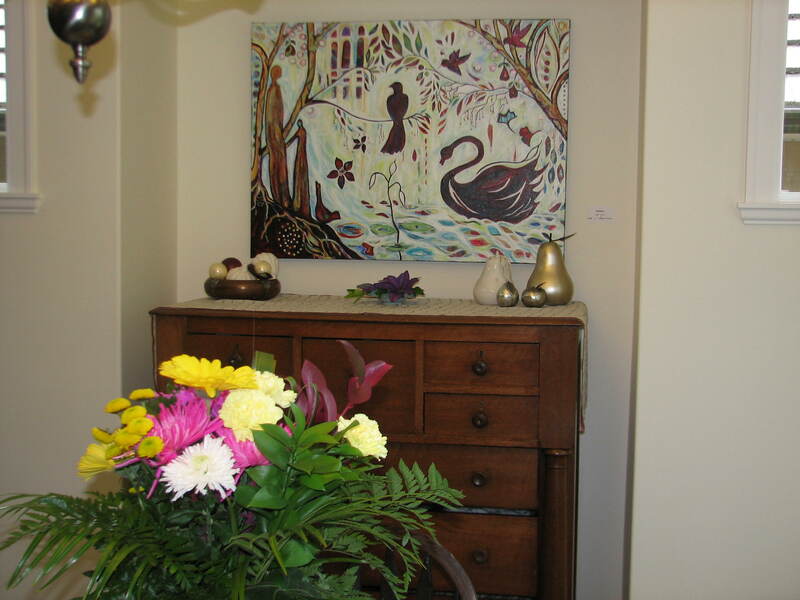 Some paintings exhibited in our living room during Spring 2015 Central Island Artisans’ Studio Tour. Here I am with some of my works at the 2015 Central Island Artisans’ Spring Studio Tour. 23 May 2015. A thoroughly enjoyable first day of the two-day Central Island Artisans’ Studio Tour. Delighted to have had a good turnout — welcomed many new visitors, plus some longstanding friends and patrons. 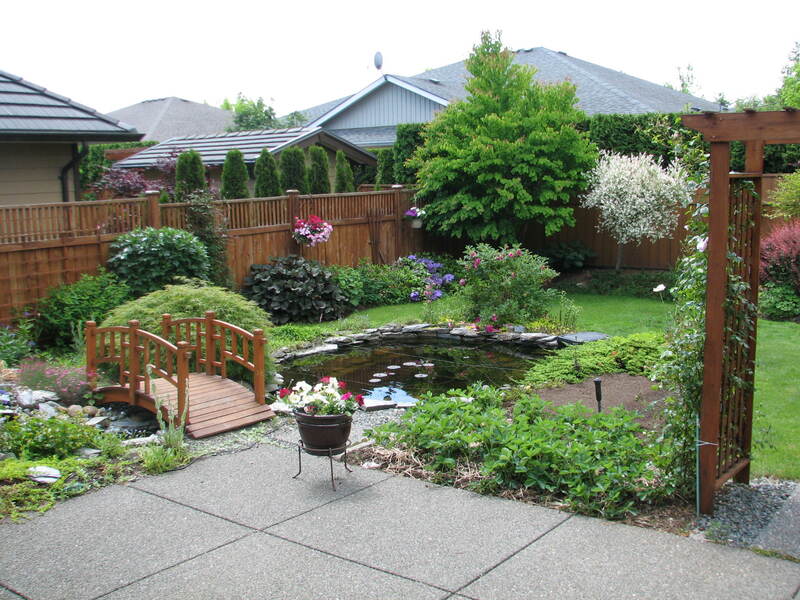 Folks seemed to like the garden, too. My ‘miraculous May’ continued with sale of “High Tide”, shown in the “Some Sold Works” folder of my Portfolio. Many of today’s guests seemed quite interested in the “altered collage” technique. So might hold a workshop to share what I’ve learned about it. Was honoured to have been asked to give two talks about my journey so far as an artist. The Comox Valley has definitely become an hotbed of interest in art. Both Rick and I are fascinated to learn how any given piece of my art impacts a particular viewer and to learn viewers’ interpretations of my abstract works. How fortunate we artists are to be able to benefit from the fine work in organizing and publicizing the tour done by the Comox Valley Community Arts Council and Bill and Bonnie Basaraba before them. 22 May 2015. Technical problem mentioned yesterday is now fixed. Many, many thanks to Matt Root for that. Portfolio of my works is now easily accessible from the main menu. 21 May 2015. Having technical problems with this web site. My portfolio of paintings keeps hiding on me. At the moment, it is found at the end of the “About Martha” page.Please bear with me while we work on it. Hope to have it readily retrievable by readers from its proper spot later today. 20 May 2015. My marvelous month of May continued today with the sale of my piece entitled “Vibrant” to a learned gentleman from Courtenay. (To view “Vibrant”, click on the ‘Portfolio’ menu and then on the image for ‘Some Sold Works’.) A wonderful way to celebrate the birthday of a close relative and to take a break from somewhat frenetic preparations for this weekend’s Central Island Artisans’ Studio Tour. 18 May 2015. Very pleased to now have posted on this site some products of the new technique I’ve been using this month. To see them, go to the menu and click on the image labelled “Flow”. 11 May 2015. What a week it has been! Not only has our family been blessed with a new baby boy, but lots of developments on the art scene. Last Monday I was excited to deliver four paintings to The Gallery at Mattick’s Farm in Victoria for the May 5-30 show “The Gallery in Bloom”. During the week I experimented with a new (for me) painting technique with mixed results, but am eager to try again. Tonja Bjermeland and I were also busy planning our June exhibition at Crown Mansion in Qualicum Beach and were excited to learn that the town will be bustling with the Classic Car Show during our exhibition. Then, on the weekend, five of my works sold in Calgary, much to my delight. It always touches me to find that buyers are moved by my work. 06 January 2015. 2014 has come and gone. I look back with gratitude for all the blessings it held. Time with family and friends, walking the beach at Tofino, whale watching at Telegraph Cove, our garden, and exploring the Island, to mention a few. I was fortunate to have participated in two outdoor art shows, two gallery/cafe exhibitions, another indoor show, and the Spring and Winter Central Island Artisans’ Studio Tour. It is a joy to connect with people who share a love of art. I want my works to find a good home and it was a privilege to see how several of my sold pieces were displayed in the buyers’ homes. It was generally a good year for sales and I wish to take this opportunity to formally thank not only my patrons, but also those who provided feedback on my work. Some new friendships have arisen out of these interactions and out of working with other artists and I look forward to more opportunities to get together with these persons in 2015. I was also privileged to be able to take in the Michalangelo exhibition of drawings at the Art Gallery of Ontario and the Lawren Harris exhibition at the Vancouver Art Gallery. Very inspiring! My studio continued to be a place of learning and enjoyment. It is good to have this space to share with family and friends. My ‘Intuitive’ series of paintings offered a new process for discovery. It combined my love of colour and self-expression in a bold new way. The recent ‘New Cedar’ series was well received. A frequent response from viewers was the feeling of serenity and tranquility which the paintings in this series evoked. Lastly, ‘Altered Collage’ work has piqued my curiosity. I enjoy the fact that I do not know in advance what will be the outcome of the processing of old National Geographic pages (using orange TKO). I also like the fact that the process creates something fresh and innovative from something previously discarded. With the arrival of the new year there is the anticipation of good things and new opportunities. I plan to up-date this blog monthly.